The nationalization of YPF has been an extraordinary move by Argentina. FT: Argentina’s Senate is expected on Wednesday to approve a bill to nationalise YPF and expropriate a 51 per cent stake from Repsol of Spain by a comfortable majority, slashing the Spaniards’ holding to 6.4 per cent. The bill would then pass to the lower house of Congress, where it is expected to be passed into law speedily. Is it really that easy? Spain and the EU may be slow to respond, but the response is coming. It is likely that the US will also support whatever action the EU takes. The response may come in the form of sanctions and/or freezing of Argentina's assets abroad (to the extent there are any), which Argentina can hardly afford. Certainly foreign investment will decline. Any chance of Argentina resuming the issuance of dollar denominated bonds - something the nation has been trying for years - is now nonexistent. The same holds true for Argentina's private issuers. IFR: Moves to renationalise Argentine oil company YPF have essentially closed the door on the few issuers from the country that could previously have tapped the international bond markets and have raised the spectre of a lengthy debt restructuring at the company itself. The 5-year Argentina CDS spread has spiked to around 1,000 bp. In a free floating FX market, one would also also see a decline in the value of the currency associated with such loss of confidence. But of course Argentina is controlling the peso exchange rate. 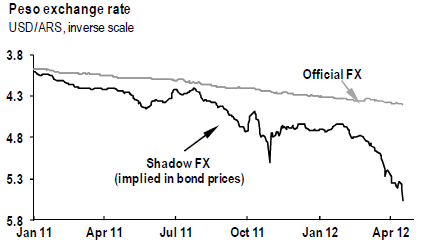 There is however a way to determine the true value of the peso - via the shadow FX rate, implied in the value of domestic bonds traded abroad. The peso value in the shadow markets is indeed sharply lower. This is an indication of capital trying to flee the country via unofficial channels. Argentina's foreign reserves which have been used to prop up the economy are sure to start dwindling. The inflation rate of around 10% will spike further as the puppet central bank will be used to print more peso. There is an enduring and painful price to pay for stealing foreign assets in order to gain popular support.